A vertical furnace enabling ultra high-temperature processing, ideal for power device manufacturing. Supports 3- to 6-inch wafers and has an automatic wafer transfer mechanism. Can be used for applications ranging from R&D to mass production. Supports lot sizes ranging from mini-batches to 50 wafers, and applications ranging from R&D to use on mass-production lines. Supports a wide range of wafer sizes from 3 to 6 inches. The furnace interior features our proprietary metal-free construction. Enables temperature monitoring in wafer vicinity. An N2 load lock is provided as a standard feature. H2 atmosphere annealing with trench rounding is available as an option. 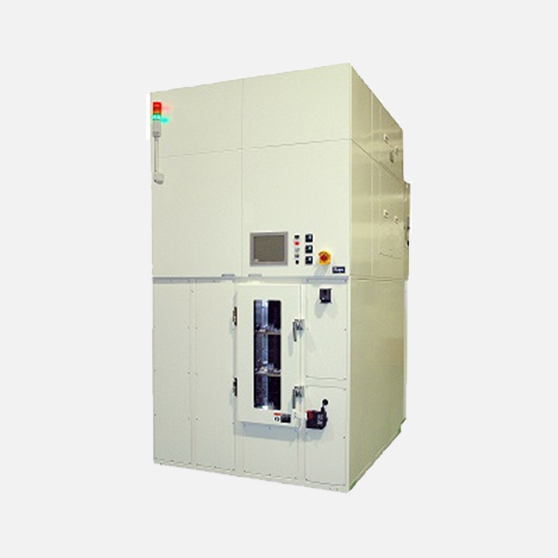 VF-3000H is a vertical furnace that can process lots ranging from mini-batches to 50 wafers, and a wide range of wafer sizes from 3 to 6 inches. Carefully selected hardware and control system features enable applications ranging from R&D to use on mass-production lines. The furnace interior features our proprietary metal-free construction. VF-3000H can process test devices (without wafer transfer), and supports ultra high-temperature activation annealing processes.